A major £5.7m development to construct a new primary school in Nottingham, has utilised external wall insulation from Wetherby Building Systems to ensure the school meets the energy efficiency requirements of new building regulations. Bluecoat Academy Primary School has been built as a response to the shortage of primary age places in Nottingham and is part of a wider scheme, which has seen Nottingham Council invest £33.2m in creating more than 4,000 additional primary school places across the city. The school, which comprises 14 classrooms, break-out areas and small group rooms, a hall, playground, specialist unit with children for autism and a nursery, has created 420 school places. 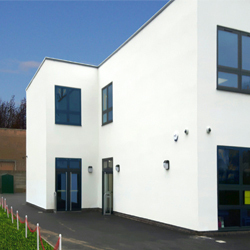 Energy efficiency was high on the agenda from the outset and so Complete Rendering Solutions was tasked with installing an effective external wall insulation system that not only met Part L of the Building Regulations but also provided a clean, contemporary feel for the school. To meet the requirements of the project, Wetherby Building System’s EpsiCoat solution was installed, with its white EPS insulation fitted to cement particle board, that was installed onto a cement frame with SFS infils. The flexibility of the insulation meant that it could be used to compensate for slight misalignments in the frame. The insulation was then finished with Wetherby silicone K 1.5mm render in white, meeting the design aspirations for a contemporary appearance, while providing the council with the added benefit of a low maintenance solution.